Tagged under Kyoko Tsuchiya, Studio DEEN, Series. Four guys work at a florist and seem to be normal folks. 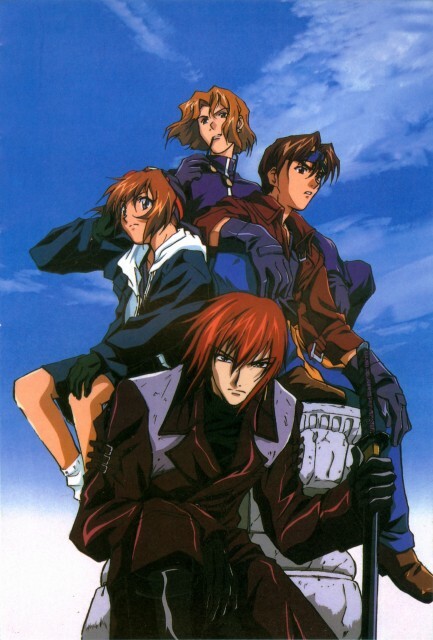 Truth is they all work for an underground organization, "Weiss Kreuz" ("White Cross"), and together they are a group of assassins who bring justice to society by eliminating those the Government cannot reach. All four - Aya, Youji, Ken and Omi - have their own dark secrets and pasts which lead them to this occupation, and by no means is it a glorious one either. As they carrying on their tasks, they encounter the seemingly invincible group "Schwartz", who possesses telekinetic (and other) powers and are standing in their way. "Weiss Kreuz Gluhen" introduces two more characters to Weiss, namely Kyo and Sena. In this series the art has been advanced to a DVD-like quality and focuses on a more central and solid plot, exploring the role of the "Estet" and their experiments. Weiss Kreuz is a well structured series with different stories with an underlying secret yet to be revealed. A spy/action thriller, Weiss Kreuz and Weiss Kreuz Gluhen offer the anticipation of any mystery subplot, waiting for the viewers to discover them. You have to give it to the Koyasu, despite not being the greatest anime of all times it is a classic and the plot is a good one, but it would definitely take more than the 24 episodes, two ovas and second part of the series shown to wrap this one up. Too many doors are opened and not enough are closed behind. However, in spite of every single down point that goes to it the creativity behind it is nice enough. Although the four main characters fall into clichÃ© because of their personalities together they make a good group which faces dramatic issues and sentimental problems well enough. It could me much more unrealistic but all-together with the music, the voices and the plot make it work, perhaps if they were separate they wouldnâ€™t be good but altogether they work. This was the first anime series I ever watched, so it holds a special place for me. I recently rewatched the first series and ova (to refresh my memory) and then Gluhen afterwards. First season, the animation is... very basic, but I'm okay with that. I enjoyed the story and the characters; though, that doesn't mean there is no room for improvement. There is plenty. My biggest issue is probably the treatment of female characters. They tend to have a bad tendency to kill off and use female characters as plot devices. Or in Schreient's case, they seem to be a harem for one of the villains. Manx and Birman are probably the only ones who don't have an extreme case where they seem to have an overwhelming urge to please a male character. Gluhen seemed to have a different mood/tone to start with and you don't see a couple of the main characters until five episodes in. The art has drastically changed (for the better!) along with the overall appearances of the characters. The story is more focused and starts off at a slower pace than the first season. But it picks up later. Overall, I liked it a lot and I am disappointed there wasn't more seasons. I have to admit, given the character design changes. I thought Sena was Omi under a false name for his student identity ... he felt like a mish-mash of Ken and Omi's personalities/designs and I didn't really care for him as a character. But I still felt for him at the end of the season. Will be rewatching Gluhen again later at some point, because I'm sure I missed a few things near the end. I really, really like the characters in this anime, but the plot itself was too superficial for my tastes. With the drama material we have here this could go for 50 chapters easily (and I'm talking about only the original series, not counting Gluhen). The OVAs left me with a taste of sequel, but it never came around. Such a pity... and the character design of the OVAs was beautiful. when i play game fire emblem, i really like assasion. So i like this story, it's awesome. I really like this series. On its time, was a fresh idea, something new to show to the anime fans. The animation is not excellent. That's why im giving only a 7. But its really nice!